Today I received a call from someone I had not heard from in quite some time. I immediately recognized her voice (as the caller ID did not give her identity away), warmly smiled, cheerfully said “hello” and was immediately into a full-fledged conversation. Catching up briefly as we then addressed the purpose of the call, I found that my day had an additional highlight to it. I realize that to some, a phone call might be more of a distraction, as there are some that definitely are. Yet, when you pick up the phone and warmth filters through, hearing from someone you love, it adds a heightened dimension to one’s day. After our brief conversation was over, I found myself with more of a bounce in my step while I continued the task at which I was previously attending. And although I was having a great day, enjoying what I had been busy doing along with the things I still had left to do (taxes, spreadsheet analysis, paperwork and more…yes, tell me you’re jealous), my day was gifted with a magical spark. 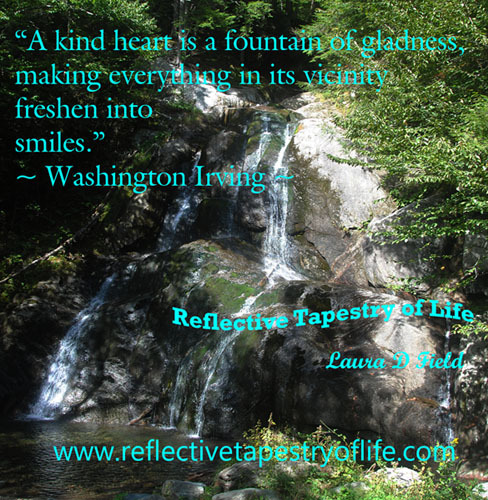 In reflection I am reminded at how a smile and a kind heart, even on the phone, can impact our day as well as others. When we smile we automatically produce a joyful energy that others are able to sense, it creates a trickle-down effect. Although I tend to be quite perky when my husband calls, he could tell that someone or something had caused a sparkle in my day, as I answered the phone during his lunch break. May your heart and your smile be filled with sparkles and sunshine. This entry was posted in Friendship, Growth, Health, Hope, Life, Love, Positive Thoughts, Today's Thoughts and tagged communication, conversation, friendship, joy, life, phone call, reflective, smile, sunshine, tapestry, warmth. Bookmark the permalink.